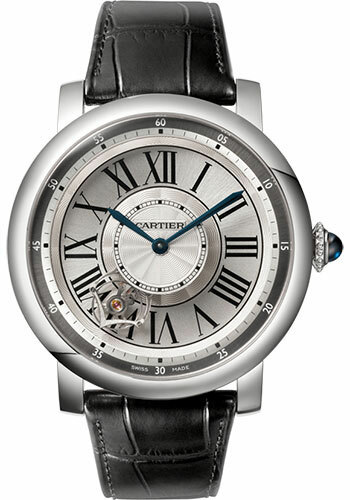 47mm 18K white gold case, 15.5mm thick, circular grained crown set with a sapphire, sapphire crystal, silvered dial with guilloché silvered upper and lower dials, black transferred Roman numerals with satin-brushed sunray finish, caliber 9451MC manual movement, approximately 48 hours of power reserve, black alligator strap, double adjustable deployant buckle in 18K white gold. Water resistant to 30 meters. 47mm 18K pink gold case, 15.5mm thick, sapphire back, circular grained crown set with a sapphire, sapphire crystal, silvered dial with guilloché silvered upper and lower dials, black transferred Roman numerals with satin-brushed sunray finish, caliber 9451 MC manual movement, approximately 48 hours of power reserve, brown alligator strap, double adjustable deployant buckle in 18K pink gold. Water resistant to 30 meters. 47mm niobium-titanium case, 15.5mm thick, beaded crown set with a black spinal cabochon, sapphire crystal, slate-gray galvanized dial with satin-finish sunray effect, white transferred Roman numerals, rhodiumized steel sword-shaped hands with superluminova coating, 9460 MC self-winding movement with astrotourbillon complication and carriage rotating around the dial in 1 minute, tourbillon carriage and escapement in carbon crystal requiring no regulation or lubrification, approximately 48 hours of power reserve, black alligator strap, 18K white gold double adjustable folding buckle. Water resistant to 30 meters. 47mm 18K white gold case, 15.8mm thick, transparent back, beaded 18K white gold crown set with a blue sapphire cabochon, 18K white gold bezel, sapphire crystal, silver dial with roman numeral dial, caliber 9461 manual-winding movement with blued-steel sword-shaped hands, approximately 49 hours of power reserve, black alligator skin strap, double adjustable folding buckle. Water resistant to 3 bar.